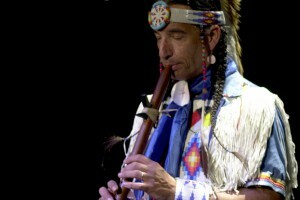 Kevin is known throughout the world as a visionary Hoop Dancer, the preeminent player of the indigenous Northern Plains flute, a traditional storyteller, cultural ambassador, recording artist and educator. "A young hunter tracked an elk to a remote, unfamiliar place high up on the mountain. He stopped to rest, and in the stillness he heard a soft, soothing, unusual sound." 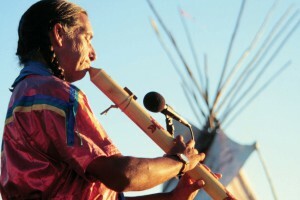 (Tokeya Inajin is his Lakota name, meaning "The First to Arise") is known throughout the world as a visionary Hoop Dancer, the preeminent player of the indigenous Northern Plains flute, a traditional storyteller, cultural ambassador, recording artist and educator. You have to see the magnificence of the Kevin Locke Native Dance Ensemble live to really appreciate why this ensemble is so exceptional. 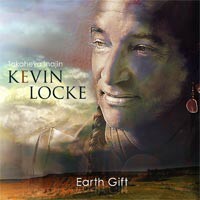 Three years in the making, this breakthrough recording, produced by two-time Grammy winner Tom Wasinger, features traditional Lakota songs played on flute by Kevin and arranged in a vibrant contemporary world music setting. Collectively referred to as the Sioux, this confederacy includes four Santee divisions, the two Yankton and Yanktonai divisions, and the Lakota (Teton) as the seventh division. Kevin was very engaging, he has more energy than most of the kids he was demonstrating to. I liked how he had enough hoops for so many of the kids to give the hoop dance a try. I think they appreciated it even more realizing how difficult it was. The students also got to play along on flutes they assembled and perform for their peers. Kevin came to our Lakota language class and spoke fluently in a demonstration and had the kids attempt a song with sign language in Lakota. We really enjoyed his visit. Kevin did an amazing job teaching our elementary students about the Native American culture. He started with a beautiful Lakota instrumental American anthem and then did an amazing hoop dance performance that even captured my Kindergarteners’ attention for the duration of the assembly. It was an honor to have him in our school. Thank you! Kevin Locke’s presentation touched the hearts of our students and staff. His presentation is so worthwhile all so many levels. He explains in an engaging way the making of the instruments like the flute and drums, and the hoops and their importance in Native culture. 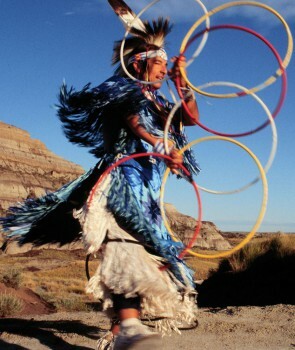 Kevin skillfully and beautifully demonstrated the hoop dances. Throughout his presentation, he interpreted verses and song in Lakota and in sign. His message of peace and acceptance is crucial. And throughout, students were involved and engaged having a great time learning. makes his music with the drum, the flute, and the rattle, along with his singing voice.